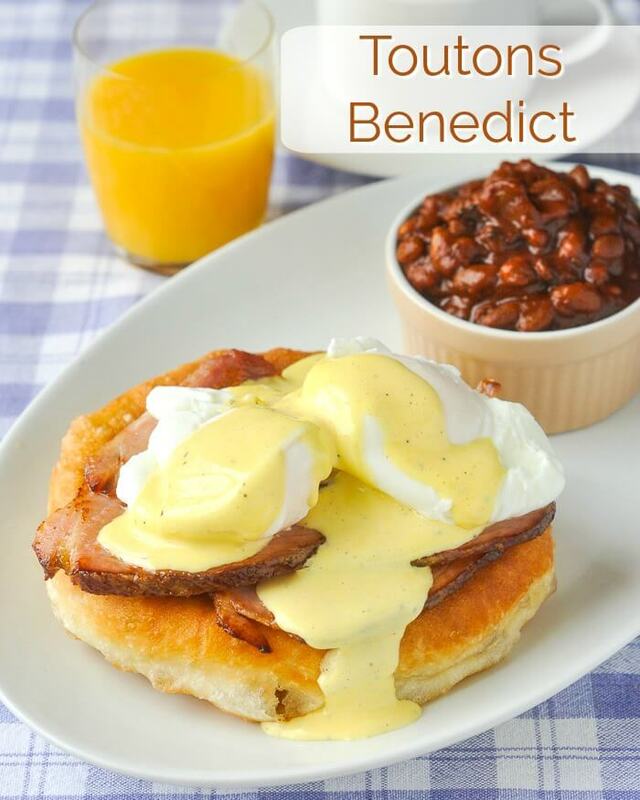 Toutons Benedict - a twist on Eggs Benedict with Newfoundland toutons! Toutons Benedict. Newfoundland Fried Bread “Toutons” form the base of this delicious Eggs Benedict version with lightly fried baked ham and a summer savoury flavoured Hollandaise Sauce. I do look forward to my weekend brunches and this Toutons Benedict really hit the spot. Toutons instead of toasted English muffins are much better as the base for this twist on a classic brunch dish. Fried tomato slices are delicious with this brunch and are just excellent with the freshly made Hollandaise Sauce. Now I know some of you are thinking why didn’t he use fried bologna instead of ham? Don’t Newfoundlanders love fried bologna? Well I don’t much care for bologna, fried or otherwise really, but fill yer boots if you’d rather use that. I happened to have some beautiful Dijon Mustard and Demerara Sugar Glazed Ham leftover from supper the other night. I sliced that thin and lightly fried it before slipping it on top of a warm touton along with a poached egg and a simple blender version of Hollandaise Sauce. 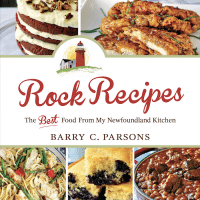 You can find the Simple Newfoundland Touton recipe HERE or try buying store bought pizza or bread dough. Newfoundland Toutons are a wonderful base for Eggs Benedict. 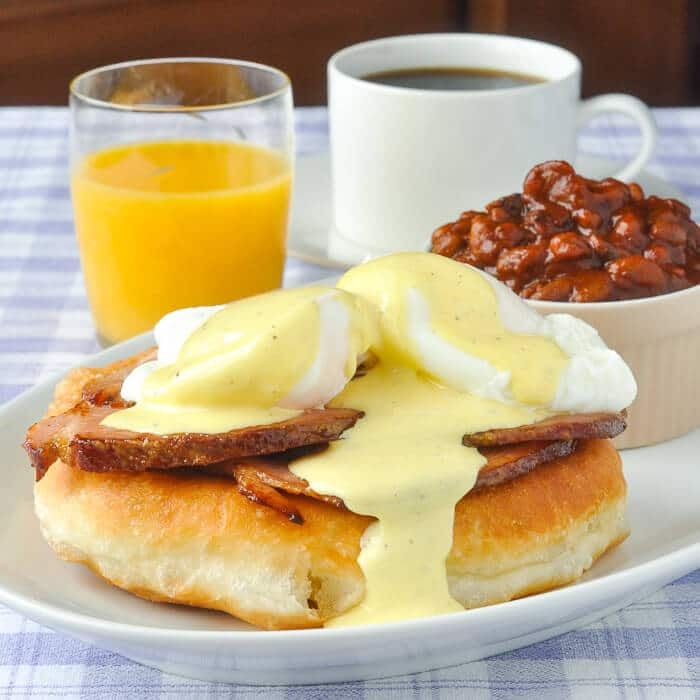 My Toutons Benedict version is pictured here with some very delicious Old Fashioned Molasses & Bacon Baked Beans. Together they make for a very hearty brunch that will see you well through to supper. Not a fan of Hollandaise Sauce? 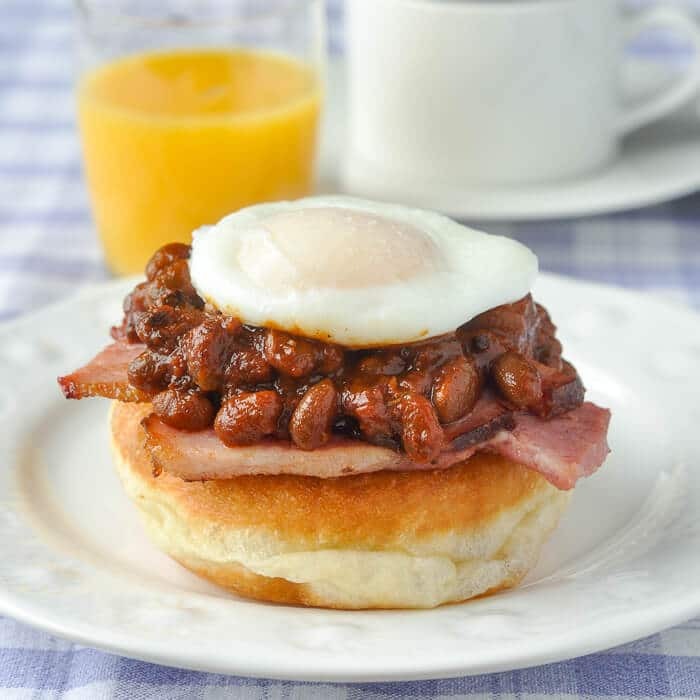 This version using the Molasses and Bacon Baked Beans as pictured in the other photographs, stacks up pretty deliciously, all on its own. 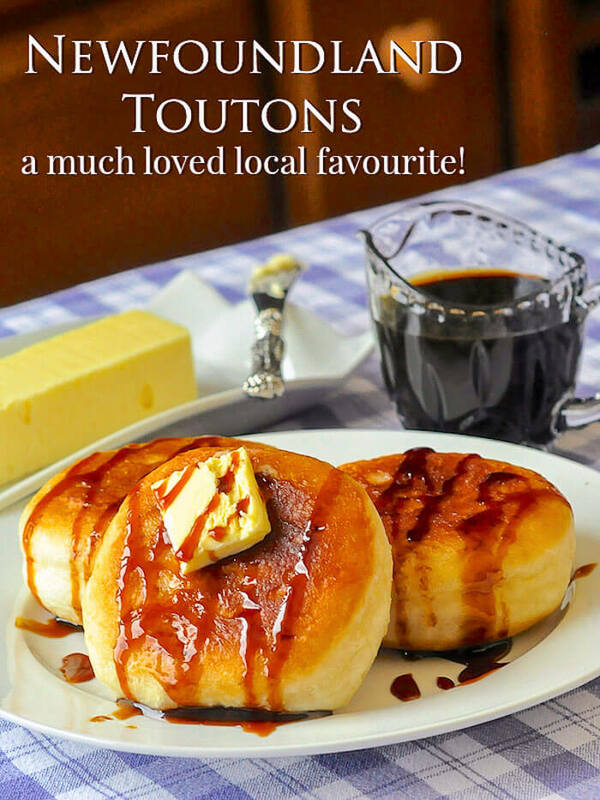 Like this Toutons Benedict Recipe? You’ll find many other great ideas for the first meal of the day on our Breakfast and Brunch Category. 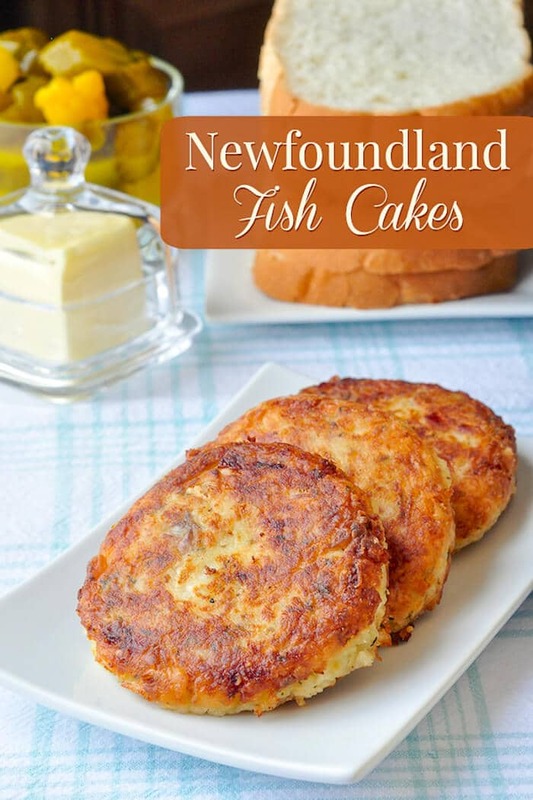 If you liked this recipe, you may also like our Newfoundland Fish Cakes, which can also be used in this recipe replacing the toutons. Newfoundland Fried Bread "Toutons" form the base of this delicious Eggs Benedict version with lightly fried baked ham and a summer savoury flavoured Hollandaise Sauce. In a blender combine the egg yolks, mustard and lemon juice for only a few seconds. With the blender on medium speed, slowly pour in the hot butter in a thin stream. The sauce should thicken quite quickly. Pour into a bowl and keep the bowl warm in a warm water bath while preparing the other components of the Toutons Benedict. Place the cooked ham on the warm toutons, top with a poached egg and finally the Hollandaise sauce. Fantastic!!! I am not a fan of hollandaise sauce, but other wise its fantastic. My sons been making his own version of stuffed toutons for years! He puts salami cheese and tomato sauce inside!! Mmmm delicious! Could dry mustard be used in place of mustard? Yeah, you guessed it! I don’t care for mustard at all. Lol. Never tried it. Worth a shot. If using dry mustard you would need a tiny pinch. You could use prepared Dijon style or grainy English style in place of yellow mustard but the sauce needs a bit of nip. Worcestershire? A-One? sriracha?